The authorities are working to complete the new national energy strategy, which is set to map the country’s objectives in this industry over the coming decades, considering that current oil and gas reserves could be depleted by around 2025, said government and industry representatives, during the third Foreign Investors Summit (FIS). “It is difficult to assess whether the level of investments in the oil and gas sector is a satisfactory one; the price of oil has hit us hard, especially at the level of services, and related industries, where there are companies that have entered insolvency,” said Artur Stratan, president of the Romanian Petroleum Exploration and Production Companies Association (ROPEPCA). “Oil and gas reserves are finite. If we do not start looking for bigger reserves, in 12 years we will run out of oil and in 9 years we will run out of gas,” said Stratan. He added that if the country does not generate extra reserves, it will use up what it has at present. On the government’s side, Adina Georgescu, counselor to PM Dacian Ciolos on energy & environmental matters, said that the energy strategy is close to completion. 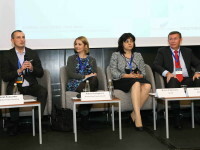 “In the Romanian energy sector we have moved forward towards the creation of a transparent and non-discriminatory gas market,” said Georgescu, who acknowledged that the renewable energy sector has gone through several changes of regulation. Silvia Vlasceanu, executive director at the Federation of Associations of Energy Utility Companies (ACUE), said the energy sector was impacted by the intervention of politicians and the instability created with each electoral cycle.